We’d love your help. Let us know what’s wrong with this preview of The Broken Way by Ann Voskamp. New York Times bestselling author of One Thousand Gifts Ann Voskamp sits at the edge of her life and all of her own unspoken brokenness and asks: What if you really want to live abundantly before it's too late? What do you do if you really want to know abundant wholeness? This is the one begging question that’s behind every single aspect of our lives—and one that The Broken Way rises up to explore in the most unexpected ways. This one's for the lovers and the sufferers. For those whose hopes and dreams and love grew so large it broke their willing hearts. This one's for the busted ones who are ready to bust free, the ones ready to break molds, break chains, break measuring sticks, and break all this bad brokenness with an unlikely good brokenness. You could be one of the Beloved who is broken—and still lets yourself be loved. To ask other readers questions about The Broken Way, please sign up. I was admittedly not terribly crazy about Ann's first book, primarily because of her writing style. I got really annoyed at the melodrama of some portions (running through fields chasing the moonlight and then falling prostrate in the mud because it was so overwhelming? Ugh. Just get up and look at the moonlight like a normal person.) From a grammatical standpoint, I just wanted to scream at her to PLEASE USE AN ADJECTIVE OR ARTICLE OR VERB CORRECTLY! But that's just my personality and preferenc I was admittedly not terribly crazy about Ann's first book, primarily because of her writing style. I got really annoyed at the melodrama of some portions (running through fields chasing the moonlight and then falling prostrate in the mud because it was so overwhelming? Ugh. Just get up and look at the moonlight like a normal person.) From a grammatical standpoint, I just wanted to scream at her to PLEASE USE AN ADJECTIVE OR ARTICLE OR VERB CORRECTLY! But that's just my personality and preferences. I will let others rate this book, because I just can't. No one can give so many stars to a raw and honest conversation in which a friend's soul is exposed in such a vulnerable way. Ann is my friend and this book felt more like a letter in which she shares so much of her life, deep wounds, and heart with "me." I love her more now and I am richer because of her; and even though our differences are many, our Savior is the same. We both hold fast to One true God, one Faith, and one Baptism. I really tried to like this book. Though I didn't love the writing style of One Thousand Gifts, I loved the message behind this first book of Voskamp's, and reading it actually made me a more thankful person. So, I decided to read The Broken Way, expecting the same outcome. Honestly, her writing style in this one is even more difficult to read. I love the quotes that she uses from other writers, but I don't love her writing. I understand the point she is trying to make in this book, but she goes I really tried to like this book. Though I didn't love the writing style of One Thousand Gifts, I loved the message behind this first book of Voskamp's, and reading it actually made me a more thankful person. So, I decided to read The Broken Way, expecting the same outcome. Sometimes I wish that I could sit and have coffee and just talk with Ann, stripping away all of the words that she wraps herself in as a writer. Ann's love for words, for her own thoughts, is both a blessing and a curse. The curse is that too often she dives into her prose, seeking poetry rather than substance. The blessing comes in those moments when she leaves the overly-dramatic monologues of life, leaves the searching for profundity, and simply states truth -- and oh, what treasures of truth Sometimes I wish that I could sit and have coffee and just talk with Ann, stripping away all of the words that she wraps herself in as a writer. Ann's love for words, for her own thoughts, is both a blessing and a curse. The curse is that too often she dives into her prose, seeking poetry rather than substance. The blessing comes in those moments when she leaves the overly-dramatic monologues of life, leaves the searching for profundity, and simply states truth -- and oh, what treasures of truth. We share much in common, particularly chapters 11 -end. "The broken way begins with this lost art of lament and until we authentically lament to God, we’ll never feel authentically loved by God. Lament’s not a meaningless rage, but a rage that finds meaning in His outrageous love. Lament is an outrage . . . that still trusts in God’s good outcome. Lament’s this articulation of the ache at God’s abandonment, then an acquiescence to His ache, and finally an abandonment to His will. Go ahead, child. Lament carries brokenness in its hands straight into the heart of God and asks for His arms. In the midst of suffering, no one needs clarifying arguments as much as they need to feel arms close. So He gives an experience of Himself instead of mere explanations, because He knows explanations can be cold comfort and His arms are warm." -Who doesn’t know what it’s like to smile thinly and say you’re fine when you’re not, when you’re almost faint with pain? There isn’t one of us not bearing the wounds from our own bloody battles. -Is there a grace that can bury the fear that your faith isn’t big enough and your faults are too many? A grace that washes your dirty wounds and wounds the devil’s lies? A grace that embraces you before you prove anything—and after you’ve done everything wrong? A grace that holds you when everything is breaking down and falling apart—and whispers that everything is somehow breaking free and falling together. -Our Savior—surrounds. Our future—secure. Our joy—certain. When we know Christ. -Eucharisteo, thanksgiving, also holds the Greek word chara, meaning “joy.” Joy. And that was what the quest for more has always been about—that which Augustine claimed, “Without exception . . . all try their hardest to reach the same goal, that is, joy.” 2 Deep chara is found only at the table of the euCHARisteo—the table of thanksgiving. -Do this in remembrance of Me. Continuously make the ever-present Christ present. Continuously be part of the re-membering of brokenness. -In shattered places, with broken people, we are most near the broken heart of Christ, and find our whole selves through the mystery of death and resurrection, through the mystery of brokenness and abundance. We are the body sustained by His brokenness, His givenness, sustained by this Last Supper that for centuries was called simply “the thanksgiving”—the eucharistias. -“Ultimately it comes down to this, that the real cause of our trouble is failure to realize our union with Christ,” Martyn Lloyd-Jones wrote. -Peace isn’t a place—it’s a Person. Peace isn’t a place to arrive at, but a Person to abide in. “I myself am your peace,” says Jesus. -Your time is limited—so don’t limit your life by wanting someone else’s. -Your time is limited—so don’t limit your life by wanting someone else’s...Time looks like light caught in the limbs of willing trees, I think, like laugh lines bracketing a thousand brave smiles, like a steady current of wrinkled sheets and slow dawns, of steam rising off bowls, of opening and closing back doors and the click of thousands of last lights out. Time is always a stream of God’s “unbounded Now,” C. S. Lewis wrote. 2 It looks like a river of Nows. Unbounded. Broken free. -Hauling out the large bag of wheat used to make bread, I stand in front of the pantry and measure out four cups of kernels. We pour them, careful not to drop the jar. “There’s your 25,550 days,” I say. Our girl rolls the jar between her hands. There’s your life, I think. How will you live with your one broken heart? The kernels of wheat rain against the glass. Take your one container of time and believe it contains exactly the time you need for a meaningful life. “How many kernels do I have to take out?” she whispers. “The ones that are already gone for me, that I’ve already lived.” That are already gone... No one can measure the length of your life, but you can always determine that your life has meaning. She’d murmured it like we were in a holy place: “All we are . . . are these grain days.” These grain days. These grace days. All I can think is, “Unless a grain of wheat falls into the earth and dies, it remains alone; but if it dies, it bears much fruit.” 3 There’s a way to multiply your life. You let every kernel die. -Maybe temporary time is made for dying to self—so your eternal self can really live. Have the hands of the clock stopped moving there in the kitchen? It takes courage to listen with our whole heart to the tick of God’s timing rather than march to the loud beat of our fears. Time can’t dictate dreams or hijack hope or determine destination. It can’t force us into living anything but what we believe. No matter what the hands of the clock say, underneath us all are the everlasting arms, and time’s arms are too weak to rob any hope, steal any prayers, destroy any joy, or crush any purpose. Time never heals wounds like God does. It’s God hands that control the universe. The hands of the clock are bound by the decisions of our hands. And He has made our hands free to be His. -The measure of your willingness to be given—is the measure of your capacity for communion. -"Why do you people always say it’s about having a strong belief in God? Who sits with the knowing that God’s belief in you is even stronger than yours in Him?” I’d put down my Styrofoam cup of black coffee and tried to read the rabbi’s face. He’d leaned forward in his seat and tilted his head so he could look at me directly. “You may believe in God, but never forget—it’s God who believes in you.” He looked out the window and pointed. “Every morning that the sun rises and you get to rise? That’s God saying He believes in you, that He believes in the story He’s writing through you. He believes in you as a gift the world needs.”...Was I living my life like I fully believed that? -truth: no change in circumstances can change your life like meaning and purpose can. No certain place can give you abundant life like a certain purpose can. Like purpose and meaning and connection can. -The meaning of being is givenness. Ask Christ. -Letting yourself be loved is an act of terrifying vulnerability and surrender. Letting yourself be loved is its own kind of givenness. Letting yourself be loved gives you over to someone’s mercy and leaves you trusting that they will keep loving you, that they will love you the way you want to be loved, that they won’t break your given heart. -To-do lists can become “to-love” lists. -It’s the longing for a comfortable safety that stands between you and everything you really long for. -I don’t know how to smooth out angst or stress or worry, but I know you either leave your worries with God . . . or your worries will make you leave God. -Busy is a choice. Stress is a choice. Giving yourself to joy is a choice. Choose well. -“Heart-shattered lives ready for love don’t for a moment escape God’s notice . . . The sacrifice pleasing to God is a broken spirit.” 6 Nothing pleases God more than letting Him touch the places you think don’t please Him. God is drawn to broken things—so He can draw the most beautiful things. -There are dishes stacked on the counter like memories tonight, and there are kids sprawled across the front-porch swing trying to read the same book at the same time. And there’s the wheat that’s now sitting back in the jar in the windowsill. And there’s me cutting our son’s hair one last time before he drives away from here. And for crying out loud, there is only so much time to be broken and given and multiplied. I never expected to get so much wrong. I never expected love like this. I never expected so much joy. Be patient with God’s patient work in you. -If repentance isn’t a daily part of your life, how is grace a daily part of your life? Repentance is what keeps turning you around, around, sanding you down, re-forming you, remaking you—making you into real. -Why is it that only once you face life without the loveliness of those you love, you can finally see how much you love? Why is the clearest way to love your life only to imagine losing parts of it? -Why hadn’t I been that gift more often? The ministry of presence is a gift with an expiry date. Everything proves it now: this is unexpected happiness, to be broken and given to bless. -“Faith is a living, daring confidence in God’s grace, so sure and certain that a man could stake his life on it a thousand times,” penned Martin Luther. -Love is the willingness to be interrupted. Interrupt comes from the Latin word interrumpere, meaning “break into.” Love is the willingness to be broken into. There are never interruptions in a day—only manifestations of Christ. Your theology is best expressed in your availability and your interruptability—and ability to be broken into. -Can I remember to let feelings be fully felt and then fully surrendered to God? Emotions are given to move you toward God. Can I remember? I don’t have to fix things, I don’t have to deny things, I don’t have to pretend away things. Could I simply feel the brokenness of things—and feel that’s okay? Could I feel okay being un-okay, trusting that Christ is always making a way? -Activity for God—is not the same as intimacy with God or identity in God. And it is your intimacy with Christ that gives you your identity. You can’t experience the power of Christ, the mission of Christ, being made new in Christ, until you know who you are in Christ. Your identity literally means “the same”—that regardless of changing circumstances, the core of you is unchangeable, stable, the same. When your identity is in Christ, your identity is the same yesterday, today, and tomorrow. Criticism can’t change it. Failing can’t shake it. Lists can’t determine it. When your identity is in the Rock, your identity is rock-solid. As long as God is for you, it doesn’t matter what mountain rises ahead of you. You aren’t your yesterday, you aren’t your messes, you aren’t your failures, you aren’t your brokenness. You are brave enough for today, because He is. You are strong enough for what’s coming, because He is. And you are enough for all that is, because He always is. -How we are is not who we are. Who we are is who He is. - I am crucified with Christ, unified with Christ, identified with Christ. Full stop. Full story. I am who He is. I am not the mistakes I have made; I am the righteousness He has made. I am not the plans I have failed; I am the perfectness He has finished. I am not the wrongs I have done; I am the faultlessness He has been. I am not the sins I have chosen; I am chosen by the Beloved, regardless of my sins. In Christ, I am chosen, accepted, justified, anointed, sealed, forgiven, redeemed, complete, free, Christ’s friend, God’s child, Spirit’s home. -Why do we rush to defend God to a broken world, and not race to defend the image of God in the world’s broken? -The world changes when we don’t categorize, polarize, and demonize people with broad brushstrokes—but when we apologize, empathize, evangelize, and prioritize people with these quiet brushes of grace. -Sometimes it helps in the moment to think: people aren’t being difficult—they are having difficulty. -Never become a container for anger. Anger is the only toxin that destroys what it’s carried in. -If we want to genuinely practice our faith, don’t we need to genuinely listen? How would the world change if we all became masters in the art of hearing heartbeats? God’s and His people’s. -‘patches of Godlight’ in the woods of our experience,” like C. S. Lewis wrote. -Why do I keep forgetting? Life isn’t overwhelming when you simply understand how to serve in this minute. -we don’t need answers to why God allows evil as much as how to hold on to the goodness of God amidst unanswered questions...The focus of God’s people is not to create explanations for suffering, but to create communities around suffering, co-suffering communities to absorb suffering and see it transform into cruciform grace. This will cost us. This will remake us into the image of Christ. -Evil is always a function of distractions, a turning away from God. Make the ever-present Christ present . . . by being present. Evil is to experience suffering without meaning, without God. Perhaps the “problem of evil” is more importantly a problem of not seeing meaning, a problem of not seeing God. Hopelessness is what flings one into the presence of evil. -“My name is Compassion7 and I will not break you, but I will break Myself for you. I am the compassionate Shepherd calling a thousand heroes to carry the light of My compassion to the broken. I will come across a thousand fields with an army of brokenhearted light-bearers for you. And you are never safer than when you feel Me redeeming your unspoken broken. “And if you forget this? I will never forget and I will never forget you and this is what My unstoppable compassion does: Behold, I have engraved you, you, on the palms of My hands.” 8 There is nothing to fear in the wilderness of suffering—it is the land where God woos. The crush of crisis is but a passage into communion with Christ. -My name on His hand. His name on mine. I am His and He is mine. Is that what I’m doing with this ridiculous experiment of penning a cross on my wrist? With just those two cross strokes, it’s like I am writing my way and my name and my identity: Enough. There is enough. Abundantly enough. I am enough, because I have enough of Him and He is always enough, and that is enough for anything. I am signing my name and my identity and being signed by the Cross One, the Risen One. I am shaping my life and letting my life be shaped, writing it down into me so it literally forms me: a passionate life is a sacrificial life. A life that wants to embrace Christ is a life that must embrace suffering. A life of giving is ultimately the most life-giving. And every single time I sign that cross on my wrist, I’m guaranteeing I can always find my sign from God, pointing the way forward—given. Broken and given into communion with Him and a thousand ways to reach right out and give it forward into the broken community of the world. A signed and sealed sign that there isn’t anything I can possibly do to make Him love me more. And in everything I am loved more than I can possibly imagine. -the cross on my wrist pulses through my skin with that one word, like everything moves and falls down around and breathes and orbits and spins and unfurls and breaks free with that one word beating like a cry at the brave center of everything: Given. Given. Here is my brokenness. Given. Here is my battered life, here is my bruised control, here are my fractured dreams, here is my open hand, here is all that I have, here is my fragile, surrendered heart, here I am, a living sacrifice. Broken. Given. -When I’m no longer afraid of brokenness, I don’t have to control or possess anything—dreams or plans or people or their perceptions. I can live surrendered. Cruciform. Given. This feels like freedom. I have such mixed feelings about Ann Voskamp's books. I am not a fan of her writing style--it is too flowery for me, and the fragments drive me crazy. I always get some good points from her thoughts, however, and this book was no exception. Once I got six or seven chapters in, I was being challenged to grow in love in a way that I hadn't been challenged before. I especially liked her points about real love making people safe, like a house over someone, a safe place where people connect intimately I have such mixed feelings about Ann Voskamp's books. I am not a fan of her writing style--it is too flowery for me, and the fragments drive me crazy. I always get some good points from her thoughts, however, and this book was no exception. Once I got six or seven chapters in, I was being challenged to grow in love in a way that I hadn't been challenged before. I especially liked her points about real love making people safe, like a house over someone, a safe place where people connect intimately, give the gift of time, and are willing to be inconvenienced--for the sake of others, yes, but ultimately for the purpose of exalting Christ and expending oneself for Him. She talked a lot about choosing to love even when it's hardest, to sit with others in their suffering and to realize that love, if it's really love, will involve a part of you dying. This book is one of the most beautiful things I've ever read. It's a raw, deeply personal, beautifully reflective exploration of how to navigate suffering as a Christian, and if you are going through something right now this book will absolutely speak to your soul. I cannot recommend it enough for those of you who are undergoing suffering of your own. And even if you aren't, still read it! It will fuel you for a time when suffering comes your way. There were so many moments where I had to stop a This book is one of the most beautiful things I've ever read. There were so many moments where I had to stop and read a phrase out loud to myself, slowly, and reflect on it before reading on, because it hit me so hard. Ann Voskamp is one of the most talented writers alive today, and reading her writing is a unique experience unlike anything else. Voskamp invites her readers into the broken moments of her life as she beautifully explores the answer to "How do we live with this one broken heart?" This stunning book leads the reader into a journey of seeing Grace, Thanksgiving, and Joy in their broken moments and how God shines in our weaknesses. Have your highlighter, pen, and journal ready as you read! I love her books and read them over and over. She's a gifted writer! * A clay sculpture of Jesus, with his hands broken off, illustrating the fact that we, His people, are to serve as His hands on this Earth. * A mason jar containing 25,000+ wheat kernels, representative of the number of days in a typical lifespan. *A red bucket, filled with gifts for a hurting family, depicting a life that is meant to be filled and then emptied again and again on behalf of others. No one likes to be broken. In our church, we sing a song, " brokenness is what I long for, brokenness is what I need," and I have been known to stop singing at that place in the song because I don't want to ask for this gift--- if gift it can be called! Ann would argue that brokenness brings the gift of koinonia (deep communion with others) if it is embraced and not feared. Jesus broke bread, blessed it, and distributed it to multitudes. This becomes an allegory: if we allow the broken pieces of our lives to be given to others, they will be nourished and we will receive the miracle of koinonia. Ann Voskamp is a poetic writer and a courageous survivor. If anyone knows about "The Broken Way..." it is definitely this author. The greatest takeaway from this book for me, is the need to share our own brokenness with others, if we want to be close with them. Like Voskamp, I am a champion at being there to listen to the stories of the pain of others, but I have been very bad about sharing my own pain. Through this book, I began to better understand the need to come clean about our own heartach Ann Voskamp is a poetic writer and a courageous survivor. If anyone knows about "The Broken Way..." it is definitely this author. The greatest takeaway from this book for me, is the need to share our own brokenness with others, if we want to be close with them. Like Voskamp, I am a champion at being there to listen to the stories of the pain of others, but I have been very bad about sharing my own pain. Through this book, I began to better understand the need to come clean about our own heartache in order to have more intimate friendships. That said, the trust issue regarding confiding in others still has to be dealt with, keeping healthy boundaries, and only sharing with those that have your best interests at heart. Yep, once again Voskamp's amazing writing style kills me with a thousand different phrases. I totally mutilated this book with highlights and dog ears and tears. Here are just a very few of the awesome things Ann had to say . . .
"Who doesn't know what it's like to smile thinly and say you're fine when your'e not, when you're almost faint with pain?" "There are graves coming, there is dark coming, there is heartbreak coming. We are not in control, and we never were." "Great grief isn't m Blown away. "Great grief isn't made to fit inside your body. It's why your heart breaks." "Maybe our hearts are made to be broken. Broken open. Broken free. Maybe the deepest wounds birth deepest in wisdom." "What matters in life is not what happens to you but what you remember and how you remember it." I could go on and on but what's the point? Go buy the book already! "The Broken Way" is a guide into abundant life through self-sacrifice. A logical progression from Ann's first book, The New York Times best-selling "One Thousand Gifts," this new book answers the question "How do you live with your one broken heart?" This is one of just two or three books which has helped me to change the way I live even while I'm still reading it. 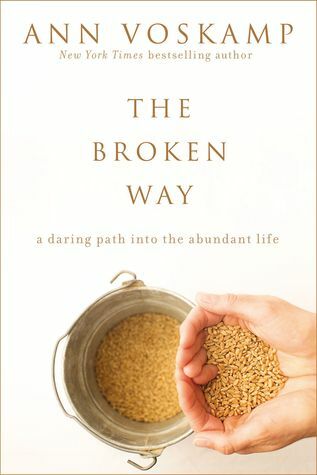 Ann's combination of storytelling, theology, practical application, and winsome vulnerability provide just the right combination to m "The Broken Way" is a guide into abundant life through self-sacrifice. This is one of just two or three books which has helped me to change the way I live even while I'm still reading it. Ann's combination of storytelling, theology, practical application, and winsome vulnerability provide just the right combination to move readers past their own broken patterns and into a new way of thinking and living. Some of my favorite quotes are from chapter 6, entitled, "What's Even Better than a Bucket List." Ann Voskamp does it again. She takes your heart, wrings it out and then masterfully fills it back up with a broken, holy, beauty saying "The miracle happens in the breaking." The breaking of bread or the breaking of our hearts. These are split wide open, and in the splitting, the "not enough" becomes more than enough. Thank you, Zondervan, for the Advance Reader Copy in exchange for my honest review. Ann Voskamp's style is hard for some people to take. Her books are prose poetry, and those who are interested in a strictly academic systematic theology will be disappointed. I find that her writing style is the most common criticism by people who don't like her books. I, however, love the way she writes. It's like an amalgam of T.S. Eliot and Bonhoeffer. Another criticism I've heard of Voskamp is that her theology is heretical mysticism that perverts the gospel. I read one "discernment" blogger Ann Voskamp's style is hard for some people to take. Her books are prose poetry, and those who are interested in a strictly academic systematic theology will be disappointed. I find that her writing style is the most common criticism by people who don't like her books. I, however, love the way she writes. It's like an amalgam of T.S. Eliot and Bonhoeffer. Another criticism I've heard of Voskamp is that her theology is heretical mysticism that perverts the gospel. I read one "discernment" blogger saying that she could hear the whispering of the serpent through Ann Voskamp's writing. I honestly don't get this one at all. I didn't find any trace of bad doctrine in this book. Maybe she emphasizes things in a different way than I would, maybe she uses non-standard theological vocabulary, but what she is presenting here is a pretty solid theology of suffering such as Martin Luther would have undoubtedly approved. She's also probably more well-read than most of her critics. When I read One Thousand Gifts, I commented that I'd love to get my hands on her commonplace book. That goes for The Broken Way as well. She quotes Augustine, Luther, Calvin, a host of Reformers, C.S. Lewis, Bonhoeffer, Kierkegaard...even Peter Leithart gets a citation here. 1) suffering is not something to be avoided at all costs as if it's some great evil, but rather is one of God's main tools in sanctifying us and changing the world. By hiding our personal struggles and brokenness from others and pretending that we're living a life of glory, we miss out on the real blessing of Christian community and koinonia fellowship. 2) Christ is all-sufficient for all our trials and struggles, and Christ most often ministers to us through His people. The Church is a community of suffering sinners lifting one another up in Christ; it's a community of compassion. Ann Voskamp takes thoughts we all have and wrestles them down to their roots. God is good all the time, so why do I not feel His goodness in my circumstance? Why is brokenness present, persistent, and permanent? She comes full circle through personal heartache and social injustice that it is only through our brokenness that we find communion with God and others. There is no way but a broken way. This review has been hidden because it contains spoilers. To view it, click here. Honestly, this book was annoyingly repetitive. I liked her book about gratitude, but this book feels like she tried to write a poetic blog entry that lasted the length of an entire book. So many phrases were repeated and repeated and repeated, in such a way that felt too emotional and unclear. Sorry Ann, I wanted to like this book. I really liked the beginning when it left me feeling like you were going to tell me what to do next after developing a deeper practice of gratitude. But I never felt en Honestly, this book was annoyingly repetitive. Sorry Ann, I wanted to like this book. I really liked the beginning when it left me feeling like you were going to tell me what to do next after developing a deeper practice of gratitude. But I never felt engaged with this book. Vulnerable. Powerful. Life-changing. Love-changing. For me, all of these things describe Ann Voskamp’s latest book The Broken Way. The insights she shared have helped me feel God’s love and grace in a deeper way and have also challenged me to love in a deeper way. This is a book I’ll need to reread at some point – or at least review all of my underlined portions (which is a great deal of the book!) I’m giving the book 4 stars rather than 5 because parts of it felt very repetitive, but overall it Vulnerable. Powerful. Life-changing. Love-changing. For me, all of these things describe Ann Voskamp’s latest book The Broken Way. The insights she shared have helped me feel God’s love and grace in a deeper way and have also challenged me to love in a deeper way. This is a book I’ll need to reread at some point – or at least review all of my underlined portions (which is a great deal of the book!) I’m giving the book 4 stars rather than 5 because parts of it felt very repetitive, but overall it’s definitely worth the read. Very inspiring! So much to say about this book and so many wonderful quotes I want to share! Almost unreadable. Ann's prose is so convoluted that I can't follow her and by the end of her story I've forgotten the beginning. "This is the deal we all get, guaranteed suffering." "Maybe the love gets in easier right where the heart's broke open." "Pain demands to be felt or it will demand you feel nothing at all." "We exist to be little Christs." "The cells that only benefit themselves are known as cancer." "You were not driven by doctrines or duties, you are driven by what you love." "You were not driven by doctrin Excellent. "Your love is best shown in your interruptibility." "Feelings are meant to be fully felt and then fully surrendered to God." "Girls can rival each other but real women revive each other. Girls can impale each other but real women empower each other. Girls can compare each other but real women champion each other. And we are all made to be ground breakers and peace makers and freedom shakers." "God takes us into the wilderness not to abandon us but to be alone with us." The Broken Way is a dare to live your life poured out for others and in doing so you in turn live life to the fullest. By breaking yourself apart and pouring yourself out for others and giving the gift of your presence you make room in your life to be refilled by Christ....You have to empty yourself to be refilled. So much wisdom to be had in these pages. I found myself underlining whole sections to revisit and ponder. Not only are the words beautifully written but Ann exposes herself and lets y The Broken Way is a dare to live your life poured out for others and in doing so you in turn live life to the fullest. By breaking yourself apart and pouring yourself out for others and giving the gift of your presence you make room in your life to be refilled by Christ....You have to empty yourself to be refilled. So much wisdom to be had in these pages. I found myself underlining whole sections to revisit and ponder. Not only are the words beautifully written but Ann exposes herself and lets you peek into her messy, unkempt, far from pretty life.In the process, she has a way of breaking you apart, breathing light into all the dark hidden corners of life then rebuilding you with the power of Gods word. I am only 11% through this book, but am overflowing with thoughts that I would like to share. The writing style in this book is unique. It is more poetry than prose. Like an outpouring of the heart splashing across the page. Yet it is beautiful. The author clearly understands brokenness, and does not broadcast answers but seems to spill her musings and insights on brokenness into the ink on the page. This leads the reader to the place where she is, and has been, and invites the reader to feel and I am only 11% through this book, but am overflowing with thoughts that I would like to share. The author clearly understands brokenness, and does not broadcast answers but seems to spill her musings and insights on brokenness into the ink on the page. This leads the reader to the place where she is, and has been, and invites the reader to feel and to grieve and to heal with her thru the process of being broken. The insight she offers seems right on, although I am no expert in this field or feeling. And she reveals some interesting insights into Scripture that provide a glimpse into the heart of God. Life-changing. To be savored and digested. Some of the best work I have ever read on the problem of pain. I first met Ann Voskamp in April 2010, after Ireti was born. I wasn't looking for a writer to read, or a ministry for my starving soul - although I needed both. I was looking for a writing outlet - a job, really. Money and purpose were driving me. Through a Google search I found the inCourage website and felt like I wanted to or could write for the website. And I wanted to get a feel for the kind of writing the curators published, and so I browsed the writers's bio page. On that bio page, it was I first met Ann Voskamp in April 2010, after Ireti was born. I wasn't looking for a writer to read, or a ministry for my starving soul - although I needed both. I was looking for a writing outlet - a job, really. Money and purpose were driving me. Through a Google search I found the inCourage website and felt like I wanted to or could write for the website. And I wanted to get a feel for the kind of writing the curators published, and so I browsed the writers's bio page. Gratitude was the message that God was trying to penetrate my hardened heart with at that time and He spoke it to me as the main dish through Ann, and on the side by other means. It was the fish principle that finally broke me open and propelled me into the practice of gratitude. After that, I was disciplined in gratitude through Ann's gratitude reflections, which she would post on her blog usually once a week until she published her book, One Thousand Gifts. While I appreciated One Thousand Gifts, I must confess I so much more appreciated Ann's blog and social media ministry. For two or three years I followed Ann and learned much just by "watching" her online. Ann later published a One Thousand Gifts Devotional, which I appreciated most because of its reflections on gratitude (like on her blog) that I can go back to and meditate on at any time - and I can do it offline. And that's really what I want to get at here, about Ann's writing. Her writing is the kind of writing that can be read over and over again because of the way it points back to Jesus Christ and the truths of the Bible - because of it's devotional nature - which is what I am most excited about with Ann's new book. The Broken Way, which will be released tomorrow, is a book that I will go back to and read over and over again. In the book, Ann shares her story of realizing that living a broken life is the way to living a miracle life. It's when we allow ourselves to be broken - in essence, to be imperfect human beings - that we can then be put back together again. And we are put back together again only by Jesus Christ, who was broken and given for us. It's no secret to anyone who knows me that I adore Ann Voskamp's writing. She has mentored me in some of the hardest to reach places of my heart and life via her writings over the last decade. I'm ever so grateful for her pursuit of God and His heart, for her diligence to read solid doctrine that is beautifully reflected in the poetic prose of her writings and for her willingness to vulnerably invite us into her life experiences, her thoughts, wrestlings and epiphanies on how to live the one lif It's no secret to anyone who knows me that I adore Ann Voskamp's writing. She has mentored me in some of the hardest to reach places of my heart and life via her writings over the last decade. I'm ever so grateful for her pursuit of God and His heart, for her diligence to read solid doctrine that is beautifully reflected in the poetic prose of her writings and for her willingness to vulnerably invite us into her life experiences, her thoughts, wrestlings and epiphanies on how to live the one life God's given us. My review will reflect my adoration of Ann and her writings. Keep this in mind. 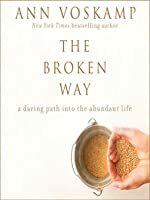 The Broken Way tells of various parts of Ann's life story and how God has gently, patiently revealed to her how what she calls the "broken way" leads to abundance, referring to Jesus's promise in John 10:10 to give His followers life abundant. The message Ann is conveying, ever so beautifully in my opinion, is that Jesus's love shines most brightly through us and to us in our brokenness. She uses the word "brokenness" throughout the book, I am imagining, for continuity with her theme, and perhaps also because it works well in the poetic phrasing she is so well known for. However, I think it really embodies several different scriptural ideas: suffering, weakness, godly sorrow, confession, repentance, trial, our finite nature, lack, imperfections. One thing that *could* be misconstrued is that as Ann is referring to brokenness as our sin. However, she attempts to clarify a difference between the brokenness that comes as a result of sin as bad brokenness versus the brokenness that comes from all the aforementioned manifestations which she refers to as good brokenness. I might be totally off track on the way I've interpreted her use of brokenness, but this is the one aspect of the book that I would love to kick around with her personally or in the context of a book study with others. Last one... and it's really hard to stop with this one because at this quote, I'm only 1/3 of the way through the book. For me, the last few chapters hold lines and lines, near whole pages highlighted. Nevertheless, I'll end with this longer quote. "Jesus risked Himself on me. How can I not risk my life on you? You may not love me back. You may humble me, humiliate me, reject me, shatter my heart, and drive shards into my soul--but this is not the part that matters. ...What matters most is not if our love makes other people change, but that in loving, we change. ...Love is always worth the risk because the reward of loving is in the joy of loving itself." Ann's books have been so timely to the season of life I find myself in when they are released. When I first read Ann's best seller, One Thousand Gifts, I was newly married and enjoying my first baby. Life was fairly simple and pretty pleasant, but of course the human heart can always find something to groan over. One Thousand Gifts was an eye opening and soul stirring call to see the myriad of gifts God places in front of me, every single day in a thousand different ways. The Broken Way comes t Ann's books have been so timely to the season of life I find myself in when they are released. When I first read Ann's best seller, One Thousand Gifts, I was newly married and enjoying my first baby. Life was fairly simple and pretty pleasant, but of course the human heart can always find something to groan over. One Thousand Gifts was an eye opening and soul stirring call to see the myriad of gifts God places in front of me, every single day in a thousand different ways. The Broken Way comes these 5 years later and finds me 2 more kids in, further along on this hard journey called life and a little busted up by this world that seems to just be falling apart around me. Particularly this year has been a tough one- I have tasted the bitterness of a death in the family, I have leaned in to the ongoing pain and struggles of several close friends and family members and I have felt broken and overwhelmed by it all. Then Ann comes along, a fellow introvert prone to melancholy and anxiety, and Asks the question, "What do you do with your One Broken Heart?" and she boldly claims "Not one thing in your life is more important than figuring out how to life in the face of unspoken pain." And then she proceeds to vulnerably and eloquently bare all the broken of her own heart and takes us on a journey to find the broken way to the abundant life. Ann is a writer unparalleled- Her voice and style are distinctively her own and she's found a faithful following with it. I love her glimpses into her family's life on their Canadian farm, around the dinner table. I appreciate that Ann comes to her readers as an "I'll go first and maybe you can relate, maybe the Lord can help us figure out something here" rather than an authoritative "teacher's" tone. Ann hits on so many anxieties and avenues of brokenness in so many relationships and areas of life and helps us to see how God can and will use them all for His glory. It hit me hard when she speaks of how of course we would have to die a thousand deaths every day to truly be Christ's to truly love and serve others- there is no place for the flesh in it at all, there is no place for selfishness, it must go. She goes on to remind us that God equips us to be and do all that he calls us to. " Christ in me makes me enough. I have more and become more, the more I pour out." There is so much to glean and ponder on in this book-this is a glass of cool water to parched and exhausted broken souls, and that is because Ann points us to the True Life Giver, the Gospel and our Redeemer.